Which additives do you need? Which are easy to use? Fast acting? Guaranteed to please? Our Review. With a large market place for engine and transmission products, cheap knockoffs are plentiful. Being an expert in additive usage on what works and what does not, I hope what I learned and now teach mechanics will help you end your engine transmission wear and tear negatives affecting it. Have cleaners that go where oil can't to an troublesome parts. Remove acids or neutralize them. Auto oil additives, motor, transmission, fuel. If your motor has one or more of the following problems, chances are you are feeling the effects of engine wear at 5 to 10 times faster than the normal rate of wear out! The products listed here the 10 products are what your car and your budget needs! Order those listed below. Each is sold with a satisfaction of usage guarantee. The brand we favor for this help, Mega Power, contain the 10 strongest protectors, some of which heal conditions that speed up wear out, producing the problem listed. If wear and tear problems show up, when you least expect them to! I'll help as your read along, to uncover your engine problem source, and the fastest, cheapest, best way to end them, so you can get on down the road of life, trouble free again! Here are the new, Easy-To-Use Top 10 auto oil additives to end oil burning, valve tap, leaks, and to tune & restore your car and equipment power and performance, yourself. The 6 best for your engine...! Using the above 6 as an engine treatment, this new breed of lo-cost Hi-tech chemistry from Mega Power are chosen because - besides solving your negative engine condition - provide a tune-up, like-new power-restoring advantage! Order the above Mega Power Worn Motor Treatment to restore engine function by ending hard starting, rough idling, stalling, engine miss, engine oil burning, valve tapping, power loss, piston blow-by. Please note: 3 of the items - usually not as potent as Mega Power's product picture above in the box with a number 3, sell at the dealership and most auto repair garages, in some other brand for around $200. The 2 numbered container sell for over $55 to $95 by competitors and - are harmful to your engine and with no guarantee OF SATISFACTION like we offer. The 6 items, the Mega Power Worn Motor Treatment is shipped by FedEx to your door in about 3 days, with easy-to-follow directions, $25 worth of phone help for free, our guarantee, and only cost $80 and $15s&h+ for $95 total. A $300 value now for a limited time. Order now! 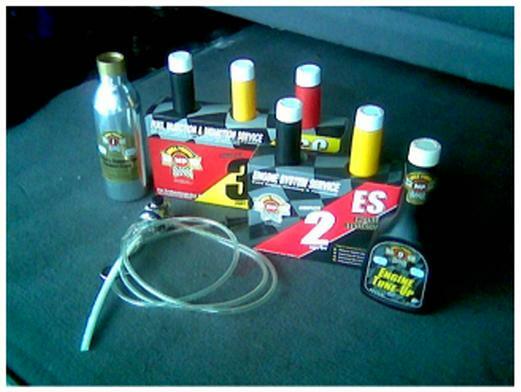 You know this is the best auto oil additives for your cars. The next 3 top auto oil additives are for your transmission. They work to condition your transmission just as describe above for your engine. Easy to use, guaranteed results in a few miles of driving. 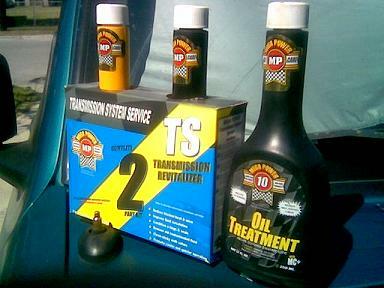 Order one MP Engine Treatment, 6 items $95, and one MP Transmissions Treatment 3 items, $75. 9 items total, just $140 and includes shipping. Save $30. Order now! Mega Power makes this possible - using friction modifiers and anti-wear residue removers - which have been found to again help your engine produce maximum horsepower to your wheels; to zip you along smoothly again - removing years of friction and residue drag, while ending your engine negatives. Leading the way is a company called Mega Power, whose problem-solving ingredients also provide a protective coating over worn piston, bearing, valve and gear surfaces. Those benefits are what car and heavy equipment owners wanting a better method of care to add years more dependible service to all their new cars and equipment, and avoid costly overhaul and replacement expenses - on their older, worn, Hi-milage or Hi-hour units. What is not to like about adding years more dependable service to your cars and equipment? You will want that help, too! We'll help you identify your wear or residue caused problem, what works best to end it, and how to do so. Engine over heating. Fluid, coolant or oil leak. We'll help you identify your problem, its cause, what works best to end it, and do so easily, by yourself. The auto oil additives needed are shipped to your door by FedEx - with easy-to-follow instructions, and Guaranteed to produce happy results. Plus - if needed, call me personally by phone. Many non-mechanic types find my remedies and my personal help the answer they need. All at no extra charge. All that is detailed for you on the page your problem is covered. By clicking links further down, or the buttons, left side. And you can call or email me, to ask a question, or order products at 512 665 3388 ... george. That's my job, and I'm America's Expert on additives. So, you have the best going for you. Compared to old fashion additives still in daily use - like those containing harmful solvent cleaners - solvent additives destroy you oils lubricity. That's no good. Or those additives with a sticky, honey-like goo - that may add to your cars mucky nature. These new products work on several levels where other brands - and oil cannot, extending their limited reach beyond, to the affected areas. Using a combination of new ingredients - called a treatment to do so, and that advantage ends your car problem. There, a series of cleaning, freeing, friction modifying, and protective measures seek out and end your car internal caused problems. New cleaners remove sticky, problem-causing residues, not add a sticky coating like STP, Lucas, and Restore type products do. The brand we favor with this cleaners, Mega Power, uses anti-wear cleaners to free sticky piston rings, valves, bearings, gears, and such - ending that part of your problem. A protective coating fills worn surfaces making for a quieter, smoother running motor - and the end of your wear, performance, leak, or such problem. That is how the brand we favor, Mega Power, ends the cause of your oil burning, tap, power loss, leak, shift, and such problems and is what you need. Just add the treatment to your car as shown and drive. Driving does the fix. These auto oil additives contain anti-wear qualities found to end, wear and performance problems that, if not stopped, go on to cause those $1500 to $3000 repairs expenses. They contain the strongest anti-wear ingredients - the secret for they success, and that adds and promotes years more like-new-again driving dependability for each vehicle treated. Our money-back guarantee assures you of the desired result or no cost for trying. Anyone can easily install them. Not just mechanics. That is the good news about today's new product technology! Click the buttons on the left that interest you, or read the review below, and then click links for the help, tips, products you need - or to learn more about how they work. Here, we will identify your problem and show the your the exact product to order, to end it with. I'm the country's top expert in all this. Not a Hi-price Madison Avenue ad writer. Each fix remedy and product was chosen because they work when nothing else does! Click LINKS in the What's New review below, or buttons on left, to locate the help you need. What new additives do work. Those that don't! The ones your car truck RV equipment needs. Solving transmission problems fast, expensively. One of America's Experts in the use of automotive oil additives, the following are the five most successful problem-solving, performance-improving types of additives. Taken from his EzineArticle.com article on the subject. They include these oil and fuel additives. Special cleaners are designed to clean 5 problem-causing areas of your engine, transmissions, and such, to end the problem. Watch out for solvent type motor flushes, stop leaks, and transmission additives. They are harmful - you heard horror stories about them destroying good motors or transmissions. That's not good! Those auto oil additives we specified do not contain solvents. Solvent cleaners are good for fuel, fuel injectors, air intake, and combustion areas - and those we recommend are blended with special cleaners and give safe, verifiable, problem ending results anyone can enjoy. When auto oil additive cleaners are combined with Friction Modifiers and Oil Conditioners a whole new range of starting, idling, running, oil burning, power loss, and shifting problems end - often avoiding the need for repair. That's what new chemical technology can do to fix your cars now! 6 tested, proven, problem-solving ingredients that quickly end the above problems are packaged as a treatment for ease of use. Just add the products, following 2 simple steps shown, to end your problem. No special skill or tools needed. The treatment ends your vehicles current wear, and performance problem as you drive. As you drive the "fix" ingredients travel to 6 of your motors sub-systems, because that is what works -- to end your car problem. - or prevents avoidable wear and performance problems in newer cars, trucks and equipment. And makes newer vehicles respond as if they had a bigger motor in them - from the products "friction modifying" capabilities. Using these auto oil additives also restores stoi-chio-metrics, the best power-producing, best fuel economy, and lowest smog producing levels possible for any given speed or load. Similar treatment products help transmission, power steering, tune up, drive gears, and air conditioning components end - or prevent their wear and tear problems, for years longer, more dependable, and trouble-free life. By the treatments very nature of coating and conditioning it stops oil burning and fluid leaks. Cost under $100. Formally, a $1500 to $3000 repair by a mechanic. Currently, the only engine products covering these advantages are found in the Mega Power Worn Motor Treatment - shown below. How cleaning and reducing friction drag in your motor and transmission improves fuel economy. "In transmissions, detergent cleaning products with actual friction and fluid modifiers in new auto oil additives perform the two actions needed to end rough shifting, shift jerks, slippage, leaks, and restore and maintain the exact shift point. Here is how ending those problems improve fuel economy. Over time those wear negatives causes gearshift to be a split-second before or after peak horsepower development. If the shift develops to soon or to late for the peak power curve - the ideal shift point, car speed is lower and becomes an extra load weight factor going into the next shift, and both become negative effects dropping your vehicle speed, instead of boosting it upward. This "early or late" shift pattern - which all vehicles large and small experience from wear, misses the ideal, easiest endeavor to keep forward momentum of the vehicle going, with the least fuel possible. [If you're leaning forward, it harder for someone to push you backwards, off balance. If upright, its easier]. - It causes more piston, bearings, and gear touch and wear levels, causing more friction, faster wear out, and more drop in speed - say from 70mph to 65 or 60mph. Of course, you feed the motor more fuel to kick up the speed. Fuel economy drops. How do you make sure your engine and transmission is timed so the peak power curve is right for a given gear shift? When dirty, and when excessive friction is present - no way possible. But clean and friction-modify your motor and transmission with Mega Power and you do both! Clean and correct and end those dirty, friction increasing conditions as your best car care problem-solving remedy. other auto oil additives to use given below. Octane boosters - fuel additives. Chemistry is capable of slowing combustion. Thereby giving a bit more push to the downward thrust of each piston. This advantage gives you a bit more speed for the same amount of fuel. You save fuel by constantly backing off the throttle, lowering speed. A fuel saving ploy. Use by most people when towing, or racing. Watch out! Most brands of octane booster are caustic. Friction Modifiers Auto Oil Additives. Two companies have friction modifiers capable of actually permitting more power to pass thru to turn the wheels faster. Friction modifiers work in two ways. One-way is to smooth roughen piston, bearing, valve, gear and such surfaces - thus reducing drag. Less drag, ends that problem-causing negative, provides less fuel-wasting characteristics. Another kind of friction modifier "coats worn areas" - which fill worn spaces between any mechanical part, seal combustion from escaping - called blow-by, and also permits slipperier movement. Friction modifiers that "coats worn areas" end many power decline problems and is a fuel improvement aid. This is because up to 20% horsepower absorbed by friction roughen surfaces is released, now available to drive your speed higher. Backing off on the gas pedal to drop increased speed is a fuel saving advantage. *Any product not falling within these specific five areas cannot improve power, fuel economy - nor solve a wear and tear caused performance problem. To begin.. this first link shows harmful additives you want to stay away from. Next, watch the Mega Power auto oil additive Demo showing the newest anti-wear ingredient MC+ that solves dozens of engine, transmission and gear problems." Their auto oil additive ingredients smooth your wear-roughen pistons bearings valves and gears so they slide turn roll and push good as new, again. on your motor and transmission internal worn spaces. This advantage benefits you by closing power-robbing worn spaces. Of course, a $1000 of new parts is better... this is next best! And for adding a smooth slippery conditioning surface - to make your olde vehicle run like new - by removing power-robbing friction drag. Mega Power ingredients are premium ingredients and selected because they give your older cars race-tuned perfection. This gives important added zip - like, when passing around slow cars, up hills, and just zippy driving enjoyment - besides the ending of your problem. Mega Power advantages - when ending your problem restores the snap-action movement of each of the hundreds of parts - like your car had when new. The Mega Power Treatment for ending your problem does some or all of this for you! Ending your problem our way - over the long run slams the brakes on the component friction wear . This is one of 6 reasons Mega Power produces more power development, giving your cars the best fuel economy and its like-new driving zip. What's not to like about trying a great invention like that? You can see why many of us like Mega Power anti-wear ingredients because they often double the remaining life of ALL our vehicles. Is that what you want? Get started. Order Mega Power Today! Each Treatment comes with easy to follow instructions, my personal phone help at installation, Money-Back Guarantee. Shipped FedEx to your door in about 3-4 days. Offer and prices subject to change or end without notice. 90 Guarantee. What if they don't work? Each auto additive treatment for your motor, transmission, fuel injector, and cooling system comes with a Do As Advertised Money Back Guarantee. Only 2 people has ask for a refund this year. Begin by clicking for details, ordering info, on our two most popular motor and transmission additives and their treatment benefits. Got a question you want answered? If you have an auto additives related question and want personal help - Call me... george at 512 665 3388 That's what I'm here for. Click around this site - for other auto oil additives and their anti-wear qualities that help slow wear to a crawl and help double the remaining trouble-free life of your vehicles.